As the recovery in the Eurozone approaches its fifth year, this column presents the latest economic forecast from the European Commission, which projects a continuation of the recovery at a steady pace (1.7% in 2017 and 1.8% in 2018). Nevertheless, over the next two years, wage growth is expected to remain constrained, the investment gap is expected to persist, the current account surplus is forecast to remain high, and core inflation to stay subdued. This suggests that there is still scope for higher growth without triggering inflationary pressures, and the Spring forecast shows that maintaining the current supportive macroeconomic policy environment is the right approach, while implementing comprehensive and productivity-enhancing structural reforms. The main immediate priority should be cleaning up the banking sector. The Eurozone’s recovery is about to enter its fifth year with an upswing that has reached most member states. Employment has been expanding and unemployment gradually receding. Confidence has picked up and risks related to political uncertainties seem to be receding. While this could spark a certain optimism about the self-sustaining nature of the recovery, a careful analysis calls for a more cautious approach. First of all, the legacies of the crisis continue to hang over the current recovery. Second, the conditions needed for economic activity to accelerate, particularly stronger wage growth and investment, do not seem to be present yet. The diagnosis of the situation has important implications for macroeconomic and structural policies. The Eurozone’s economic expansion has benefited from a supportive macroeconomic policy environment, with monetary policy in particular having been very accommodative. The ECB's monetary policy actions have triggered a substantial easing in financing conditions, which has been key to support the recovery. Bank lending rates for companies and households have reached historical lows and lending volumes have increased. Borrowing conditions have been re-converging across the Eurozone, after the significant financial fragmentation experienced in the economic and financial crisis. In this supportive policy environment, economic activity has surpassed pre-crisis levels. Economic growth in the Eurozone, however, remains constrained by legacies of the crisis such as high levels of private and public debt, large stocks of non-performing loans (NPLs) in the banking sector, and elevated unemployment in several countries. The slack present in the economy seems to go beyond what is suggested by headline data. Despite favourable financing conditions, the fact that investment as a share of GDP remains relatively weak, below long-term averages, testifies to the incompleteness of the current recovery. 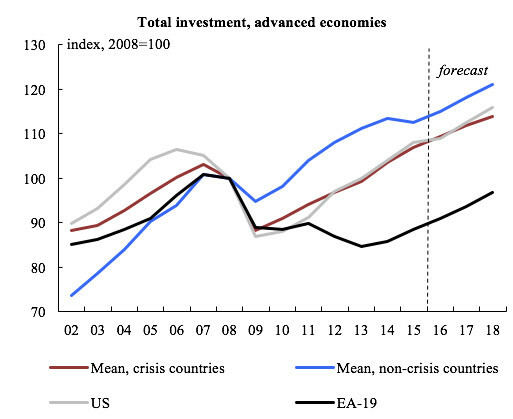 Investment has so far failed to pick up at a speed that is typical of past recoveries, and has remained depressed for far longer than in other advanced economies hit by the crisis (see Figure 1). The subdued growth outlook, ongoing deleveraging needs and uncertainty are at the root of this atypical feature of the current recovery. Notes: Y0 is the year of the cyclical through in the EA (1983, 1993 and 2009 respectively). EA12 (15) includes BE, DE, IE, EL, ES, FR, IT, LU, NL, AT, PT, FI, (SI, CY, MT). Mean crisis countries include CH, JP, SE, UK, US. Mean non-crisis countries include AU, CA, KO, NO, NZ (European Commission, 2017b). Another distinctive feature of the current economic context is the low profitability of the banking sector in a number of Eurozone countries,1 due to NPLs, inadequate business models, high operating costs and/or overcapacity. This continues to cast a shadow of doubt over the ability of banks in these countries to support a more substantial pick-up of investment demand once it occurs, while other sources of financing are unable to fill the gap in the bank-dominated European financial landscape. The potential for negative feedback loops between low growth and low bank profitability, and between weak banks and the sovereign appears to be still in place in some member states, as highlighted in the latest IMF Global Financial Stability Report (IMF 2017). Low levels of investment, combined with high corporate and household savings, are also behind the high current account surplus of the Eurozone, which reflects a dynamics of aggregate demand weaker than output dynamics. Slack in the labour market is still substantial (see also ECB 2017), as a further sign of the atypical nature of the recovery. Unemployment has been falling but remains high (9.5% in February 2017). It is still 2 percentage points above its pre-crisis level and about 0.8 percentage points above the Non-Accelerating Wage Rate of Unemployment (NAWRU). Long-term and very long-term unemployment are still far above pre-crisis levels, which is a matter of concern. The number of hours worked per employee has remained broadly flat in recent years and well below pre-crisis levels, and the share of involuntary part-time work has continued to increase since the crisis erupted. The longer unemployment and under-employment2 lasts, the more likely it is to exert permanent negative effects on the workers concerned, increasing the risk that a cyclical phenomenon turns into a structural one that depresses potential growth. Unemployment rates also remain painfully high for some groups, particularly young people, and especially in peripheral Eurozone countries (see Figure 2). This is of particular concern as prolonged spells of unemployment can cause long-lasting damage to the careers of young people. Dual labour markets can further contribute to this 'scarring effect' by trapping a considerable share of the young jobseekers in temporary contracts with little training opportunities, nor time to develop on-the-job skills, acting as a brake on skills and productivity growth. A synthesis of the atypical features of the current Eurozone recovery, and the important inter-linkages between them, is provided in Figure 3. First, the figure highlights the positive relationship between persisting substantial slack in the labour market and the persistent investment gap recorded in the Eurozone, through the dampening effect slack in the labour market has on domestic demand expectations, which negatively effects investment decisions. This has the potential to generate an 'accelerator trap', as indicated in the figure.3 Subdued demand also manifests itself in low core inflation. This persistent investment gap, partly related to this low demand and demand expectations, also entails the risk of an 'erosion of potential growth' in the longer term. Additionally, the current Eurozone recovery appears too dependent on external demand through its large current account surplus, pointing to 'low indigenous growth'. Notes: u = unemployment rate; u* = Non-Accelerating Wage Rate of Unemployment (NAWRU); I = investment as % of GDP; I* = investment as % of GDP, 1995-2008 average; π core = core inflation; CA = current account balance as % of GDP; CA* = current account norm as % of GDP (estimated based on economic fundamentals). At this stage, enthusiasm about the recovery would appear premature. There is not sufficient evidence yet that the Eurozone recovery has become self-sustaining, in the sense that it does not depend on supportive macroeconomic policies. Indeed, in the European Commission’s spring forecast the expectation that economic expansion in the Eurozone will continue at a steady pace (real GDP growth is forecast at 1.7 % and 1.8 % for 2017 and 2018 respectively) and become more broad-based is predicated upon maintaining this supportive macroeconomic policy stance. As highlighted in the Commission’s forecast, the outlook for wages has now moved centre-stage for the sustainability of the recovery. It will be important for private consumption growth, the main growth driver so far, as well as for its impact on the speed at which inflation normalises. Real wage growth per employee (currently well below its historical average) is expected to remain constrained over the next couple of years. This reflects a number of factors: i) the impact of persistently low inflation on wage formation; ii) the slack in the labour market with its inevitable effect on wage bargaining; and iii) the impact of weak current and expected labour productivity growth (forecast at 0.7 % in 2018, last forecast year, well below the rate experienced in the period preceding the crisis).4 Reabsorbing the wage growth-constraining impact of the first two factors can be expected to take some time. As long as significant slack in the labour market continues, increased demand for labour tends to trigger greater supply, with little impact on wages. But as the recovery moves forward and gains strength, unutilised and underutilised resources would start exhausting, and wage growth would resume in a significant way as labour demand pressures build up, and also trade unions see their bargaining power in wage negotiations increase. But at the current juncture, there is still insufficient evidence of these pressures building up. As for the third factor behind constrained real wage growth, expectations about future labour productivity influence current wage bargaining, meaning current wages depend, among other things, on such expectations. 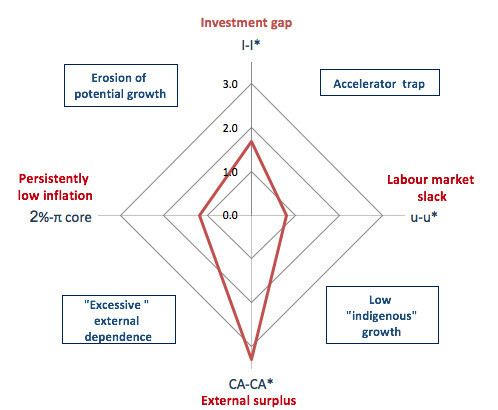 Through this channel, factors that influence expectations on future labour productivity have an impact on current real wage growth.5 And in particular, all productivity-enhancing structural reforms that shape those expectations can provide support to wage growth, while poor implementation of these reforms is in part responsible for subdued wage growth today. Based on the Commission's latest forecast, the investment gap is not likely to be filled in the near future. The contribution of investment to the Eurozone’s expansion is projected to remain broadly unchanged over the next two years, and only moderate investment growth is expected to take place, despite the very favourable financing conditions. Among the determinants is also the modest demand outlook, related, among other things, to the constrained wage developments. At the same time, the Eurozone’s high current account surplus is projected to recede only gradually over the forecast horizon, remaining still high (2.9 % of GDP) in 2018. After the peak reached in the first quarter of 2017, headline inflation is expected to gradually recede (to 1.3 % in 2018, down from 1.6 % in 2017). Core inflation (excluding energy and unprocessed food) remains subdued (at 0.8 %-0.9 %, below its long-term average) and is expected to increase only very gradually over the next couple of years. There is still insufficient evidence that price pressures are building up and that inflation is stabilising with sufficient confidence around the ECB's target of below but close to 2% over the medium term, in a self-sustaining manner (in the sense that it would maintain its trajectory even with diminishing support from monetary policy), as also highlighted by ECB President Mario Draghi (Draghi 2017). The divergence between the recent strong readings of economic sentiment from survey data and more mixed hard data deserves attention too. It could simply signal a turning point, but could also reflect the adjustment to a "new mediocrity".6 And this leaves some uncertainty on whether and when strong economic growth will follow rising sentiment. What type of policy indications can then be drawn from the picture described above? Considering the atypical nature of the current recovery and the high level of uncertainty, caution should guide policymakers' actions. In the current circumstances, the potential costs from maintaining the current degree of policy support appear smaller than those that could be triggered from a premature policy tightening. Extended policy support therefore appears as the most sensible option for policymakers at the current juncture. The last meeting of the ECB's Governing Council has indeed confirmed that the net asset purchases (under the Extended Asset Purchase Programme) will continue until December 2017 or beyond if necessary, and that key policy interest rates will remain at their current or lower levels for an extended period of time, and well beyond the horizon of the net asset purchases. This very accommodative monetary policy remains appropriate in the current context. Maintaining very favourable financing conditions is still essential to support demand and inflation dynamics, ultimately making the recovery stronger and more durable. At the same time, should there be a risk of financial bubbles in some market segments, effective macroprudential policies to make sure that credit flows within the Eurozone are not fuelling bubbles, nor regional/sectoral imbalances, would be the best tools. A responsible, growth-friendly fiscal policy also has to play its role in supporting demand in the Eurozone so as to avoid overburdening the ECB and contribute to reduce global imbalances. Therefore, achieving a supportive fiscal stance for the Eurozone seems appropriate at this juncture. Countries that have fiscal space should use it to support domestic demand, particularly investment, and those that do not have it should ensure compliance with the fiscal rules. In particular, prudent fiscal policy should be run by high public debt countries. This is all the more important in the current context of long-term interest rates that have already started increasing (in part in anticipation of changes in the policy mix in the US), and also in consideration of the effects that rising interest rates might exert on these countries' banking sectors. While rising long-term interest rates help to increase the profitability of the banking sector via maturity transformation, they also exert negative valuation effects on holdings of sovereign debt. These negative valuation effects dominate for banks with large sovereign bond holdings, while, conversely, positive profitability effects dominate for banks with low sovereign bond holdings. Risks from a higher long-term interest rate environment therefore tend to be relatively more pronounced for high public debt countries with banking sectors characterised by large sovereign bond holdings. Under these circumstances, a prudent fiscal policy is essential in order to preserve financial market confidence, and must be accompanied by decisive action to fix vulnerabilities in the banking sector (including NPLs), also to avoid the resurgence of negative bank-sovereign feedback loops. All countries should finally ensure a growth-friendly composition of their public budgets. Continued efforts to create the right conditions for Eurozone members to thrive, achieve high productivity levels and quickly absorb shocks are needed. Here the keywords are comprehensive and well-sequenced structural reforms. Labour market reforms are an important ingredient but, generally speaking, a narrow focus on these reforms would tend to be misguided. Reforms that incentivise innovation and competition are just as important in providing a boost to the euro area's growth potential, increasing its productivity and its capacity to adjust. Appropriate sequencing is essential (IMF 2016, Coeuré 2016). Product and services markets reforms, which tend to reduce the potential short-term side effects of some labour market reforms on employment and wages, should optimally precede the latter. In the sphere of labour market reforms, active labour market policies, shifting taxes away from labour and measures to address labour market duality should be given top priority. At the same time, the implementation of productivity-enhancing structural reforms should be strengthened. When credible, they provide additional support to aggregate demand and thereby complement supportive macroeconomic policies by shaping expectations on future labour productivity, which effects real wage growth today. Resolute policy action is needed as a matter of priority to address vulnerabilities in the banking sector, particularly in countries with high public debt, as indicated above. Here, a holistic approach should be taken to tackle all types of vulnerabilities weighing on bank profitability: high NPLs, inefficiencies in business models, and overcapacity. A comprehensive approach that tackles the legacy of high stocks of NPLs and prevents their build-up would help to break and prevent vicious circles, in which low asset quality results in low bank profitability and constrained lending, which in turn negatively affects growth (European Commission 2017c, Aiyar et al. 2015). The spillover effects that high NPLs in some member states can have on others through financial systems that are highly interconnected clearly confers a European dimension to the problem. This calls for a coordinated approach at European level, alongside measures in the member states. A Eurozone-wide strategy to address viability risks in the banking sector (as called for in the Eurozone recommendations) would ideally combine national policies under a common European umbrella. Pro-active policy action on NPLs should be taken as swiftly as possible, using the space for action opened by the relatively benign current macroeconomic environment. Delaying a solution to this issue is only likely to significantly increase the costs of having to deal with it later. 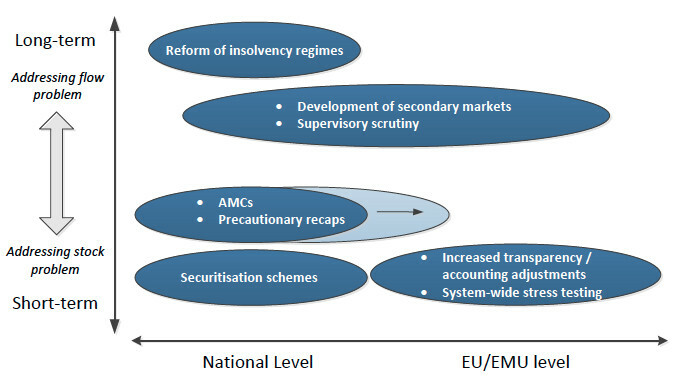 Among the specific policy measures, the development of secondary markets and eventually the establishment of asset management companies are particularly relevant in the medium term (see Figure 4). Finally, further steps to complete the institutional architecture of the EMU are needed to make sure that the euro area provides its citizens with durable and self-sustaining growth, jobs and security. As a first step, the completion of the Banking Union with the European Deposit Insurance Scheme (EDIS) and a credible common backstop to the Single Resolution Fund7 should be accelerated. Ambitious steps towards the Capital Markets Union should be undertaken in parallel. In the medium term, progress should be made towards a Eurozone -wide fiscal stabilisation function, which would endow the EMU with a tool for stabilisation against shocks that cannot be managed at national level alone (Juncker 2015). The Eurozone’s recovery is about to enter its fifth year, and the upswing has reached most countries. Confidence has picked up. The recovery nonetheless still has a number of features that make it atypical: investment as a share of GDP remains relatively weak; the banking sector suffers from persistently low profitability in a number of member states; and substantial slack persists in the labour market. At the current stage, enthusiasm about the self-sustaining nature of the recovery appears premature. Over the forecast horizon, wage growth is expected to remain constrained, the investment gap is expected to persist, the current account surplus is forecast to remain high, and core inflation is forecast to stay subdued. In this context, caution should guide policymakers' actions, as the costs of maintaining significant policy support appear smaller than those from premature policy tightening. This means that monetary policy should remain accommodative and that the fiscal stance at the Eurozone level should be supportive. Macroeconomic policies should be flanked by comprehensive productivity-enhancing structural reforms. Cleaning up the banking sector, where stocks of NPLs are high, should be the main priority. This is all the more important and urgent in the case of high public debt countries, where efforts to reduce NPLs on banks balance sheets should accompany prudent fiscal policy in order to preserve financial market confidence. Authors’ note: The authors are grateful for the input of Bjorn Dohring and Raffaele Fargnoli. Aiyar, S, W Bergthaler, J M Garrido, A Ilyina, A Jobst, K Kang, D Kovtun, Y Liu, D Monaghan and M. Moretti (2015), "A strategy for resolving Europe's problem loans", IMF Staff Discussion Note 15/19, September. 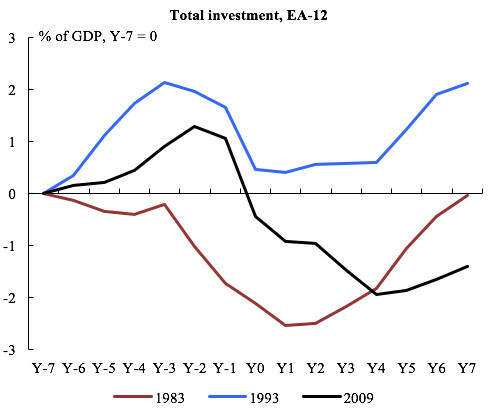 Barkbu, B, S P Berkmen, P Lukyantsau, S Saksonovs and H Schoelermann (2015), "Investment in the Euro Area: Why has it been so weak?”, IMF Working Paper 15/32. Blanchard, O (2017), "Self-fulfilling pessimism", Video Vox, 27 February. Coeuré, B (2016), "Structural reforms on the way to a complete Economic and Monetary Union", speech delivered at the International Conference on Structural Reforms in Advanced Economies, Hertie School of Governance, Berlin, 17 June. Draghi, M (2017), "Monetary policy and the economic recovery in the Euro Area", speech delivered at the ECB and Its Watchers XVIII Conference, Frankfurt am Main, 6 April. ECB (2017), "Assessing labour market slack", Economic Bulletin 3, May. European Commission (2017a), "European Economic Forecast Spring 2017", European Economy Institutional Paper 053, May. European Commission (2017b), "European Economic Forecast Winter 2017", European Economy Institutional Paper 48, February. European Commission (2017c), "A macroeconomic perspective on non-performing loans", Quarterly Report on the Euro Area 16(1), February. IMF (2017), Global Financial Stability Report: Getting the policy mix right, April. IMF (2016), World Economic Outlook: Too Slow for Too Long, April. Juncker, J C, in cooperation with D Tusk, J Dijsselbloem, M Draghi and M Schulz (2015), Completing Europe's Economic and Monetary Union, 22 June. A negative gap is observed between banks' return on equity and cost of equity for the Eurozone. The condition in which people in the labour force are employed at less than full-time or regular jobs, or at jobs inadequate with respect to their training or economic needs. This is inspired by the 'accelerator model', based on which investment is expected to pick up as the recovery strengthens (see Barkbu et al. 2015). Other factors contributing to the explanation of the observed low wage growth include the fact that most job creation during the recovery has been concentrated in low productivity sectors. Structural explanations for a loss of trade union bargaining power have also been put forward (see box on "Inflation: between temporary effects and slow trends" in European Commission 2017a). This reflects the analogous argumentation by Blanchard that expectations about the future influence current subdued demand growth in the US (Blanchard 2017). See the box on "A 'new modesty'? Level shifts in survey data and the decreasing trend of 'normal' growth" in European Commission (2017b). This would be fiscally neutral over the medium run.